Time tracking has never been so easy. Our aim is to provide our customers the best solution to their problems. That’s why the hours we have spent talking to you in order to understand your needs resulted in many weeks of hard work. We wanted to make our software more usable and helpful. It makes us more than happy to announce a new version of TimeCamp. What you can expect? Let’s have a short tour! The biggest and most significant change are our timesheets. It’s a starting point for everyone who needs to measure time units spent on each assignment. Not only to bill your clients accurately to the work done, but also to estimate team commitment and work on your and their efficiency. – „Start & Stop” – The less you need to do to track your time, the better. With new TimeCamp one click is enough to start logging minutes and hours for each task or project and one to stop it. Simply, use the timer. – “Drag & Drop” – It may happen that one task will be recorded few times are they are interrupted by different assignments. If you want to have the time for it aggragated, simply drag the record and drop on one another. The time collected will sum up. Have you ever forgotten to fill you timesheets? Now it’s not a problem. Even if you haven’t switch the timer on, you can always fill the blanks manually. Just pick the task or enter the name of it and choose the right amount of time spent on it during the day. We are aware that many of you work on different project management software, like Trello, Podio, Pivotal Tracker, Assembla and many more. You can integrate your favorite tools with TimeCamp. You’ll be able to precisely track time for everything you do. Cost estimation and planning resources are very important. 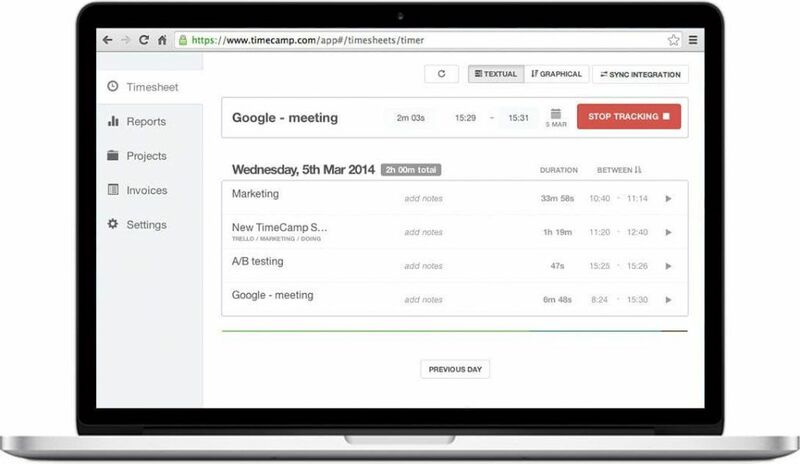 Now, with new TimeCamp you and your team will receive an email when your budgeted time is exceeded. What is more, we rebuild a report that shows all your budgeted projects and how far you are in those projects. This will help you make necessary changes along the way. Check the new version and log into your account. We hope that it will make your work and life easier. One more thing, feel free to share your opinion with us. but ‘TIMESHEETS’ by current week’s days in sidebar was so useful for me. are you going to return it back? @Alex – yes we are planning to make some simple stats.